Whether at your restaurant or at the ballpark, our custom printed Dispenser Napkins are the perfect fit for any occasion. 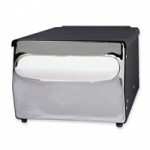 Our printed napkins come in many sizes to fit any size napkin dispenser. Our Dispenser napkins, also known as custom napkins or personalized napkins, are the perfect way to put your company branding in front of your customers. These 6.5” x 5” folded napkins are sure to dispense the branding image you want to convey to customers. Custom printed Dispenser Napkins are available in white as well as brown Kraft. 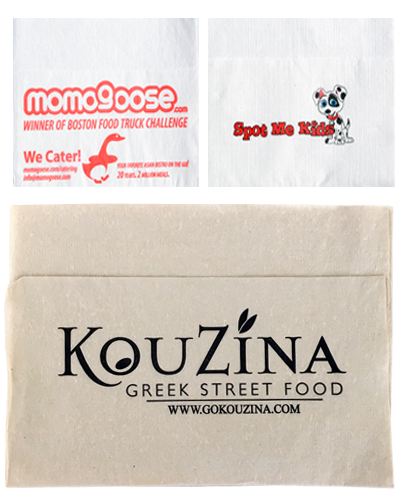 Our Custom Printed Dispenser Napkins are the perfect branding tool for any event! How many Dispenser Napkins do I need to buy? Custom printed Dispenser Napkins have a 12,000 piece minimum order requirement. With our short lead times and small order requirements this napkin is a perfect fit for any occasion. How long will my Dispenser napkin order take? Lead time for custom printed Dispenser Napkins is 2-3 weeks. Rush orders are available for an additional fee when the production schedule allows. What are your Dispenser napkin printing capabilities? Dispenser Napkins can be printed up to 4 spot PMS colors. We are able to match any PMS color on the chart with some metallic ink options available. What kinds of art files are required for proofing? Bitmap files are never accepted as they are too low quality. Vector art files are preferred. Adobe Illustrator, .EPS and high resolution PDF files work best, however, if the line artwork is simple enough, sometimes a JPEG file will work. Need a price quote on custom printed Dispenser Napkins? Contact us today! Need a formal napkin for your restaurant or event? Check out our line of custom printed Dinner Napkins.